One of the biggest drawbacks of purely steel induction cookware is their inefficient distribution of heat from the magnet-produced heat from the heating disk located at their bottom portion. 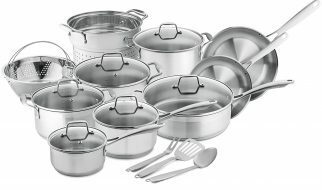 While iron-heavy steel is the optimal material for induction processes, cookware that is too heavy on iron also usually have a tough time getting the induction-produced heat to where it needs to go. The first thing that stands out about this Chantal skillet is its copper component which ensures even heat distribution as well as increased heating efficiency. 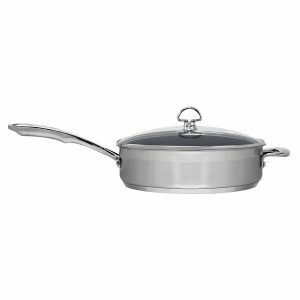 In line with the expectations of consumers who are shopping for new induction cookware, we size up the Chantal SLIN34-280C Induction 21 Steel Saute Skillet according to its special features, optimal long-term value, cooking versatility ease of handling during the cooking process, cleaning ease, and, of course, overall durability. Made of all Japanese steel that marries strength with even heat distribution, this saute skillet has a strong copper infusion that ensures heat generated by its induction-powered heating disk is not only distributed at maximum efficiency to the rest of its sides and surface, its alloy mix also includes titanium thereby ensuring durability and surface strength. This titanium component enables this skillet to withstand routine punishment and wear from regular use with flying colors. Its ceramic nonstick surface can handle quite a bit of impact and scratching actions without wearing away or becoming compromised. This Chantal model is also health-consciously designed: its alloy is completely free of nickel to ensure nickel-sensitive or nickel-allergic diners are free from any nickel-related allergic reactions. Unlike other induction cookware that use ceramic tops for its bottom surface, this unit has a great combination of titanium, copper, and stainless steel. This metal combination speaks volumes of the reason for this pan’s design-to conduct induction-generated heat as quickly, effectively, and efficiently as possible for topnotch saute cooking. Indeed, when heated up, this pan delivers high heat so evenly that you can rest assured the fish fillets or chicken breasts you’re sauteing will be heated evenly sooner rather than later. You can thank the conduction-boosting copper component of this pan for this speedy heating regardless of whether you put in on top of an induction cooktop or an open gas flame or even an electric coil. This heat source versatility adds tremendously to this unit’s overall value. To stretch out the full value of every penny you spend on any product, it is a good idea to figure out the full range of uses you have for that product. Using the product more frequently, under a wide range of situations, boost its overall total use value. You spend less and less money per usage and you truly get maximum value for your hard-earned dollars. Thankfully, this Chantal skillet’s titanium, copper, ceramic and steel combination produced cookware that is at home on an induction cooktop range as on an open gas flame or electric heating coil. You can even use it in the oven with no hassles. Regardless of the heat source, you are assured that your food will not only be evenly heated but it will come off the skillet quick and easy-thanks to this model’s durable ceramic surface. Its flat wide bottom and high capacity construction also enables you to tackle cooking larger portions. It does this without sacrificing balance. When it comes to transferring varying amounts of food, this model makes it a breeze because you can use the ergonomically designed long handle for most transfers and tipping while its helper handle is properly designed to help you with heavier loads. This unit’s rim is specially designed for dripless pouring. You have a lower chance of hassling with harder to scrub side drippings on the exterior of the skillet. This is a big deal because its exterior sides don’t have a non-stick surface and this can make dried drippings and spills a hassle to clean. Finally, thanks to the tempered-glass transparent construction of its lid, this Chantal model makes it very easy to check up on your cooking. Weighing in at 7.2 pounds, it’s natural for first time users to think the 5 quart Chantal SLIN34-280C may be too heavy to wield around the kitchen. Actually, it’s dual handle design makes moving around heavy batches relatively hassle-free. First, its long handle is designed with ergonomics in mind so you are assured of a stable grip as you lift the whole skillet. Just by using its main handle, you can move this cookware from one heating surface to another with relative ease. In case you are cooking a heavy portion, this model has a shorter handle that gives you the leverage you need to safely and easily handle this cookware. Both handles don’t get hot so you can grip them with confidence. 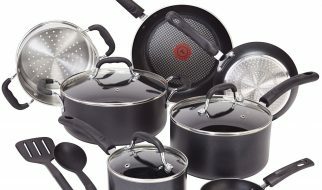 Given its larger profile, you are assured of a double treat: relatively easy handling mixed with high capacity cooking. Despite its 7.2 pound profile, you would not have to worry about lugging this cookware awkwardly under running water to properly clean it. Thanks to its durable ceramic non-stick surface, you can easily wipe away any grease and stains with as little as one swipe of a soapy water-infused sponge. No need to soak the pan before you wipe it down. After you’ve wiped it down, you only need to hold it by both long and short handles to gently but quickly guide it to position under your faucet’s cool running water. Quick, easy, and hassle-free the Chantal SLIN34-280C’s clean up is actually so much easier than its size and weight profile would lead you to think initially. The Chantal SLIN34-280C Induction 21 Steel Ceramic Coated Saute Skillet comes with a limited lifetime warranty. Thanks to its great mix of titanium, ceramic, copper, and stainless steel, it’s not a surprise to know that this model is intended to withstand long-term use with no hassles at all. Easy to handle, highly efficient, versatile, and robust, this is one induction cookware you should strongly consider if you’re looking for a high capacity skillet that maximizes the value of your kitchen budget.